Howdy you. Flying Carpet's back in action this Thursday. 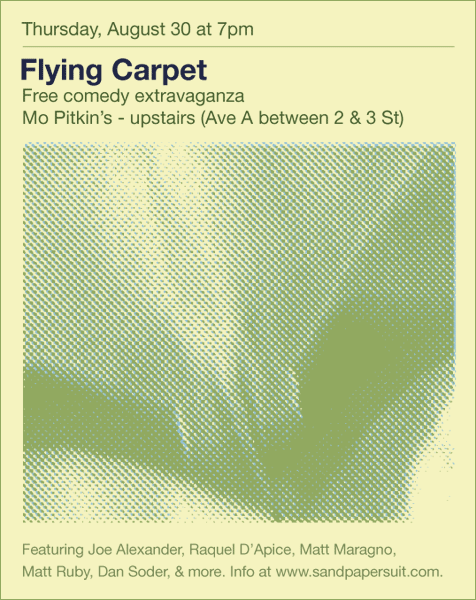 It'll be UPSTAIRS at Mo Pitkin's and free. Starts at 7pm *sharp* so don't lollygag. * The picture on the flyer is of a stingray. I took it at the Baltimore Aquarium. But quite a few people who have seen this flyer see something different when they look at it. They see female naughty parts. You know what I call these people? Perverts. ** That said, it would be pretty awesome if a girl referred to her jj as a "stingray." Ladies, work on it.